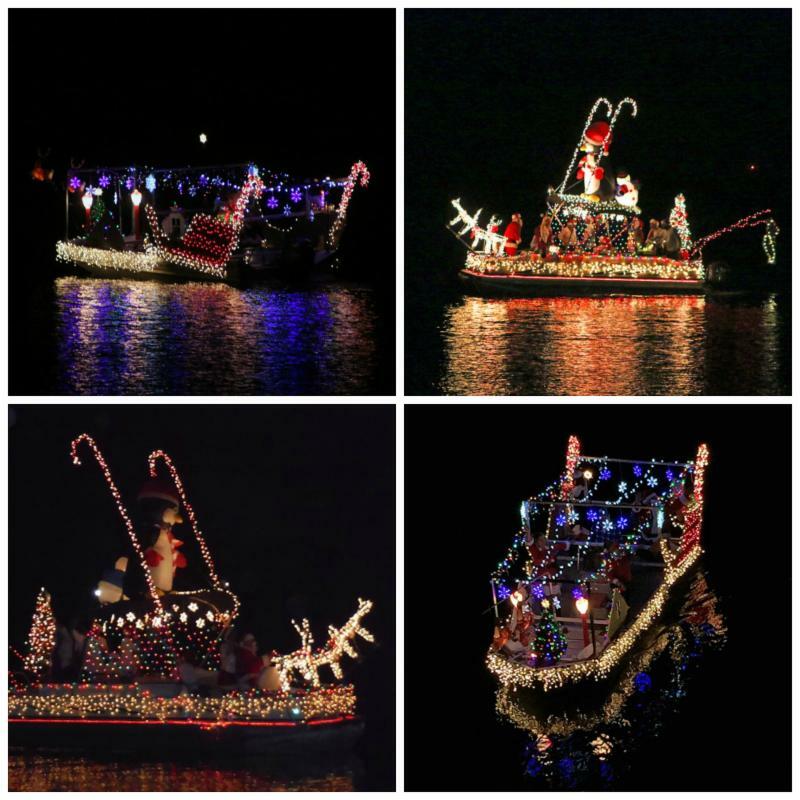 We’re hoping everyone had a great Christmas season, and that you’re looking forward to another year of fantastic Florida fishing at the Sea Hag Marina. 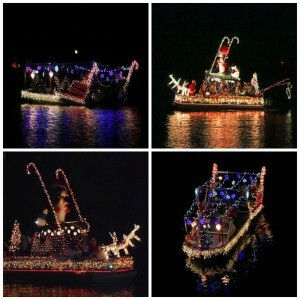 Steinhatchee had its annual boat parade this year, with some fantastic entries. The weather was perfect, and a great time was had at the many parties after the parade. The Hatch was hopping! We finally got some really cold temperatures that put the trout in a feeding frenzy for about a week…and then things warmed up and the fish got confused again. For much of the month, it was feast, with a few days of famine mixed in. Redfish are usually pretty lethargic and spread around this time of year, but I had one day in which we caught 22 redfish. Many of them were short fish, but it kept our rods bent for a good part of the day. When the cold hit hard, the trout flooded into the river and surrounding areas and they were hungry. Capt. 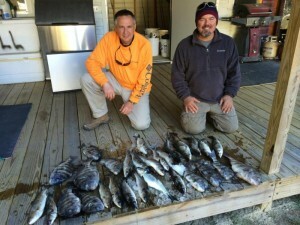 Tommy Thompson and I caught a 10 fish limit in 15 minutes near some rocks south of the river. Everything we caught at that location was a larger fish, most around 19 inches long. We also fished in the river and found boats catching fish on every cast, but keepers were a little harder to find. Some of the larger fish were taken upriver of the bridge near the powerlines. There were certainly lots of limits taken from the river, but with the warming temperatures the fishing got a bit tougher. 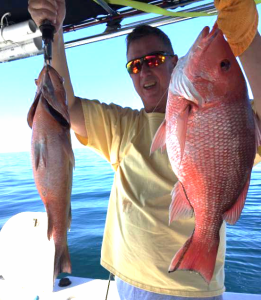 There were some excellent catches taken along the shoreline farther to the south, as far as Pepperfish Keys, and in colder weather in the deep trench that runs north of the islands. 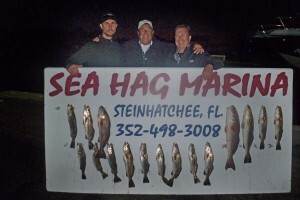 Probably the most consistent way to catch fish this time of year is nighttime gigging in the river, and the Sea Hag team has refined their techniques so that they always return with a load of fish. The weather kept many offshore captains in port, but on good days there were some great catches of amberjack, and much further out, red and mangrove snapper. Kingfish and Spanish mackerel were still around but vacating the area on their move south. Here are some pictures of this month’s catches. 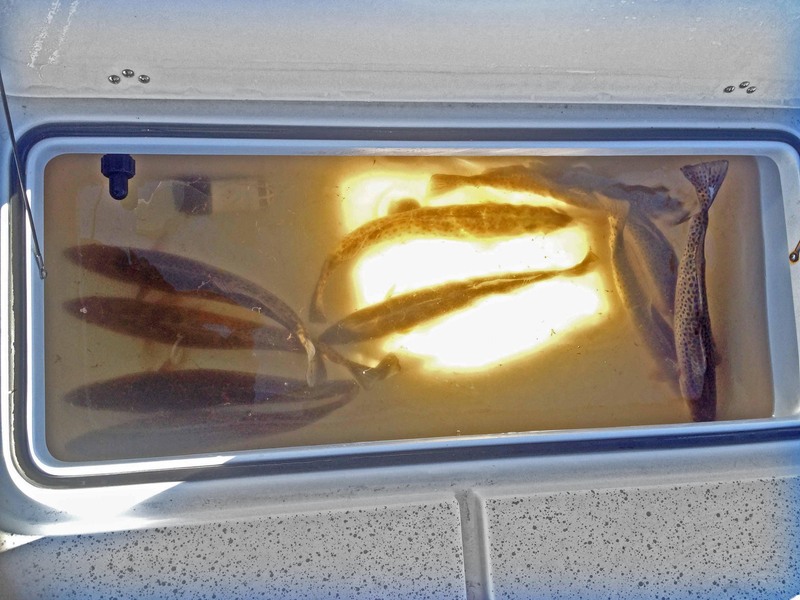 Winter delight–a livewell full of 19 inch trout. I took old friend Capt. 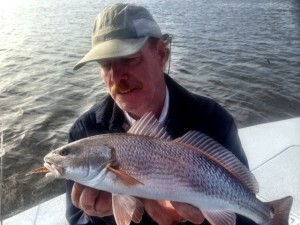 Joe Jacobs from Lake Worth out for some redfishing. 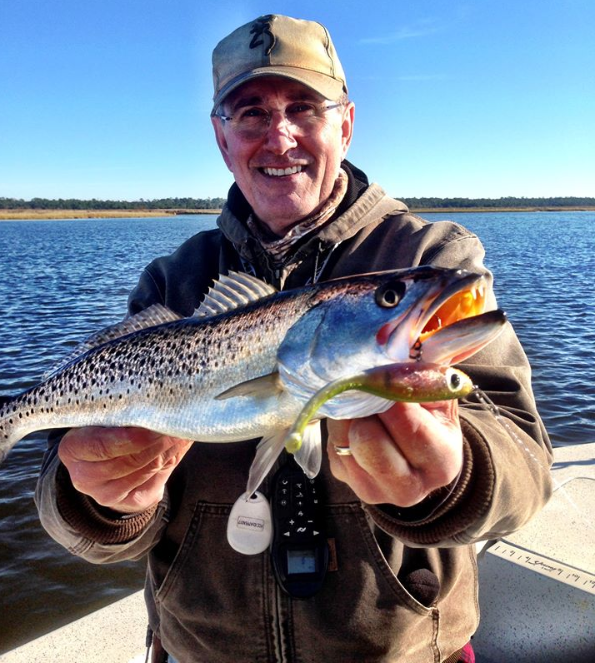 On a later trip, Doug Barrett found this fine gator trout fishing a Paul Brown Corky lure. 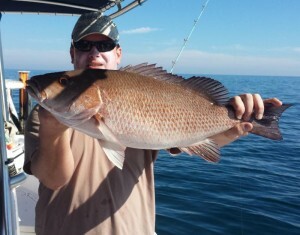 Running way offshore, Jason Boan found this tasty mangrove snapper. 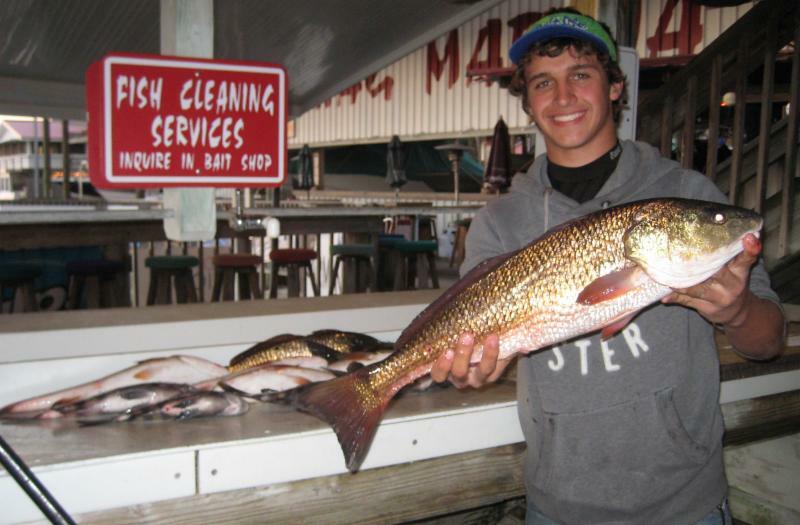 Brett Molzen from Bell brought in this upper-slot redfish for the table. Chaeli Norwood on a gigging trip bringing in a large river sheepshead. Nicole Aedo, fishing with Capt. Tommy Thompson, landed this beautiful redfish. On another gigging trip (their first), Jim Kilgore and Lee Waldron from Hahira nailed these mullet and sheepshead. Toby Griffis with an excellent catch of large trout caught with his wife Kristin. Mike Potapaw and Trey Carr with a pair of scale buster gator trout. Derek Simpson from Macon with a fine pair of snapper. Unfortunately one of them had to go back in the water. 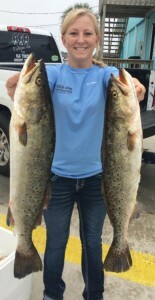 Anna Patterson holding two huge trout caught by Danny O’Neill and friends from Valdosta. 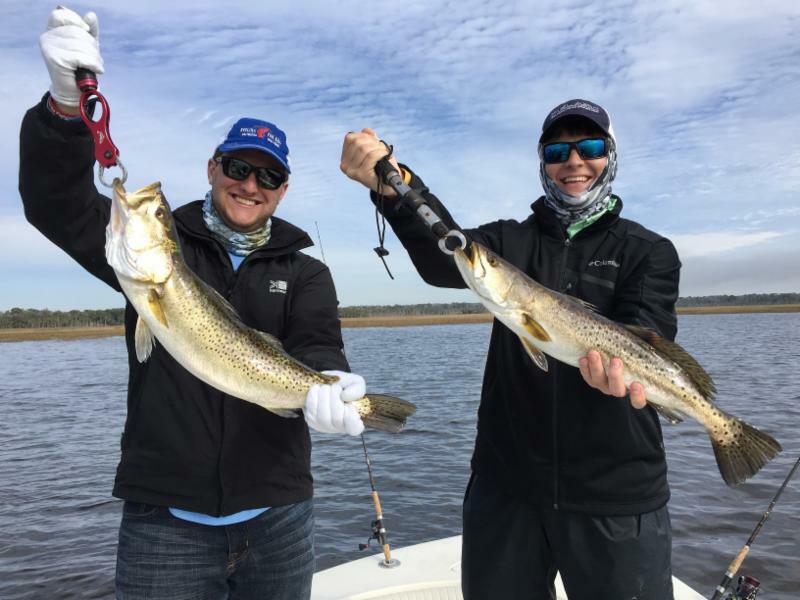 Luke Matthews fished with Chase Norwood and Corey Horner from the shoreline near one of the creeks…and they did quite well. Max Leatherwood, master night fisherman, and friends brought in these beautiful trout and redfish. When the temps drop, the river is the place to be! January is always a consistent month…in that it’s always inconsistent. 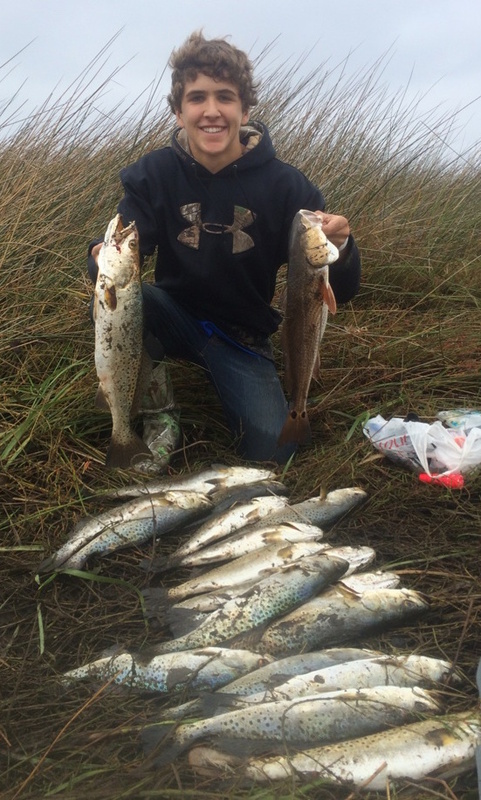 The extremely warm ten days in December sent many trout out of the river to deeper water on the flats, but that won’t last. Although the first weekend of the new year is forecast to have highs in the high 70s, there are cold days coming our way. If we can maintain overnight lows in the 40s, we will be looking for more river, creek and nearby schooling behavior in trout, even the larger variety. 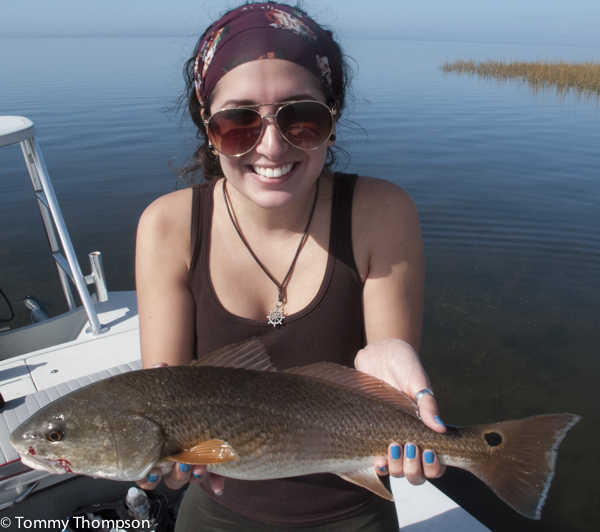 While redfish will be hit-or-miss, here’s what to look for when the temps stabilize. Being coldblooded, fish have two important behavior changes in cold water: first, their metabolism slows down, along with their activity. This means they lose the usual aggressive activity to eat that they have in the remainder of the year. That translates into an important tip for winter fishing: you need to slow down as well. Rapidly jerking jigs or plugs just doesn’t work consistently. Fishing slowly is essential, whether with drifted live or artificial shrimp, or suspending lures such as the Paul Brown Lure Series from Mirrolure, the Sebile suspending lures such as the Flat or Stick Shadd, or the Rapala SSW series. 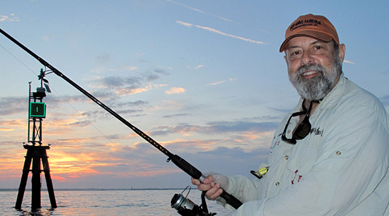 The bite may be nothing more than a simple tap, making braided line a real advantage in this situation. Sometimes in shallow water we might throw out a Gulp shrimp under a popping cork and just leave it in place, just off the bottom. The other important fish behavior in cold water is that, not surprisingly, fish will search for water that may be just a few degrees warmer than the surrounding area. 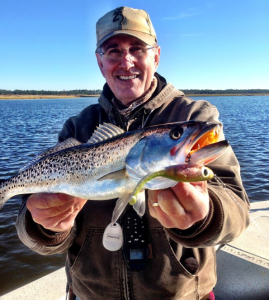 The obvious warmer areas are deep water (further away from the cold air than on the flats)….which means the Steinhatchee River, some of the surrounding creeks, or the numerous deep creek beds that run through the shallow flats. I listed some of these spots in last month’s report. It’s also warmer in the afternoon; unlike the rest of the year, we might not hit the water until 10 or later during the winter. And finally, just like selling a house, a good location is essential. Good locations are those that are heated up during the daylight hours. Because the sun tends to be low, those locations often include south-facing mud banks along creeks and rivers, very shallow rocks that be heated during the day and hold that heat in higher tides, and oyster bars. Most guides have closely guarded locations that are very effective in cold weather, but you can easily figure out your own. The ideal situation is a few days after a cold front, with warming temperatures and an early or mid-morning low tide and a mid-afternoon flood. The low water exposes bars, banks and rocks to the sun, and when the tide floods in the fish will seek out those areas because they will hold heat. 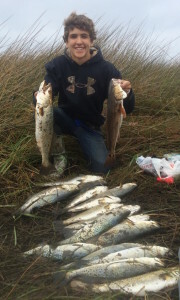 We have had situations where we have caught 40 trout, all around 4 pounds or more, in two hours without moving the boat. That won’t happen in the rest of the year because these large trout tend to school only in the winter. So consider some of your regular fishing spots, and think about how the areas respond to low water and sun. Same situation in the river….with an afternoon warming high tide, try fishing the banks along the edges of the river instead of the channel. You’ll be surprised at how well you do. 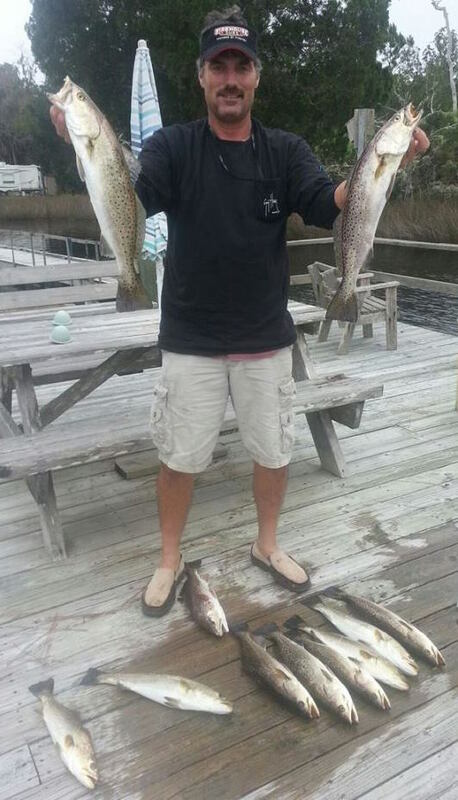 All this talk about trout doesn’t mean that those offshore anglers need to just stay home. Capt. Wiley Horton (http://www.tunersportfishing.com/) sent me this forecast for January. Finally, the guides and staff at the Sea Hag Marina want to wish you a Happy New Year full of lots of outdoor activities. There are exciting changes going on at the marina (yes, by scallop season there will be beautiful swimming pool nestled amongst the Shacks). 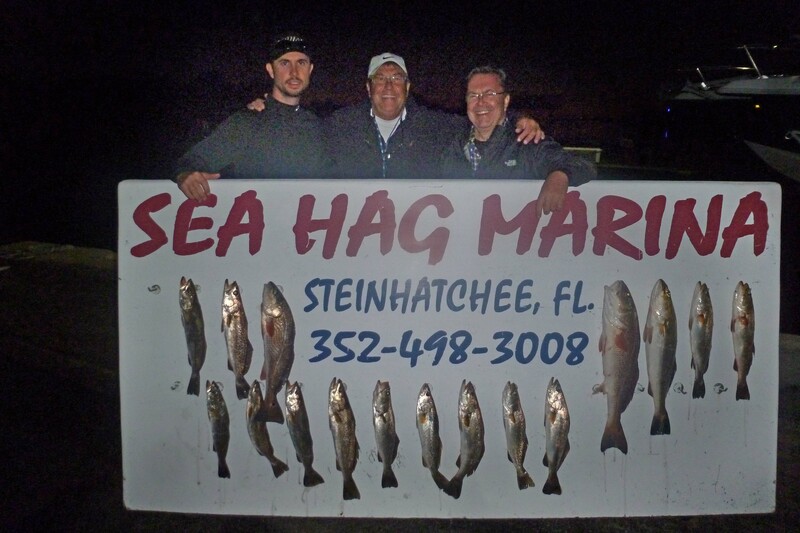 We are here for all your fishing and diving needs, boat rentals, a variety of accommodations and friendly hints that can provide a great and productive visit. Happy New Year to all!